I am back from my trip to Toronto and full of ideas and contacts and inspiration. I sometimes forget how necessary it can be to step outside your everyday life and explore another world. And even though I spent my early twenties in Toronto, it really felt like another world to me. My how things have changed! But I met lots of people, saw lots of beautiful things and filled up my heart with lots of great experiences. The main reason I went to Toronto was to see The One of a Kind Show and Sale. This general public show occurs twice a year in Toronto and as well as other cities like Vancouver, Chicago, and New York. The Spring show is the smaller of the two shows but still hosted hundreds of artisans in every discipline imaginable. I was very proud of our Nova Scotia / Love, Me peeps representin’ and wowing the T.O. public. It was fun to see the Shibang booth – super clean with shots of colour including that impressive framed textile piece in the centre of her booth. After above mentioned cupcake/chocolate wolfe-down whilst walking the aisles, I turned a corner and literally ran into Melanie of Meversible of those adorable (and crazy popular) reversible small peaked hats. 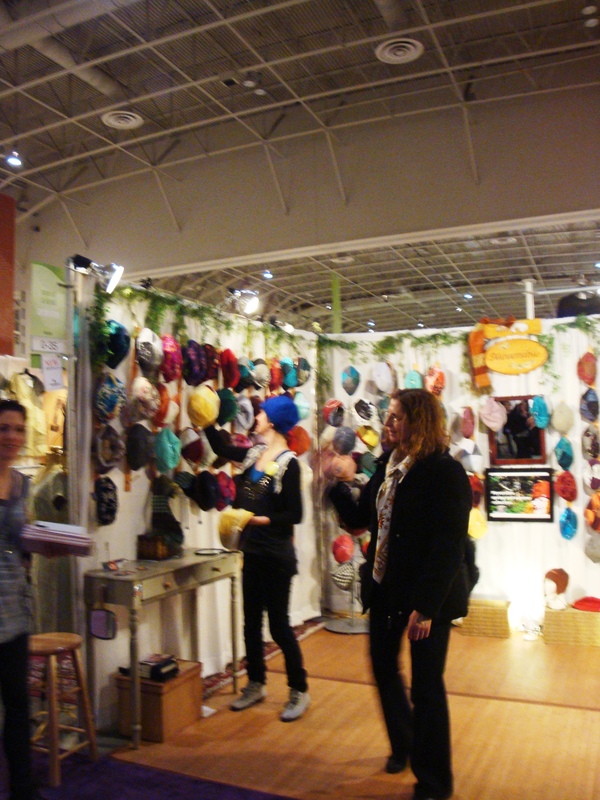 Her booth was so fun – filled with every possible colour and texture combination! It was so great for me to see the work of artisans I have only “met” on-line or whose blogs I have read. Seeing work in person is so much more experiential (confirming for me why I am not an on-line shopper). And then there are all the people I discovered who are not present on-line or don’t have much of a presence. I fell in love over and over and over. And over. And lucky for you Love, Me shoppers – some of these artisans will soon have work here for you to drool over! As we climbed into our car in search of real food for dinner, my friend and I remarked on the wealth of talent in Canada. Once again, I am loving my job. I got a chance to meet so many amazing people, see some great shops like Love, Me focusing on handmade (Bookhou, Bluebird Handmade, Natalie-Roze, and Fresh Collective), go to a show that blew my mind and introduced me to even more talent, all the while staying and visiting with my best friend and her family. Good times.